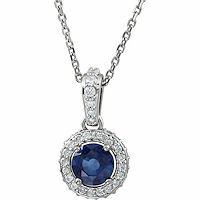 14Kt White Gold Sapphire & Diamond Necklace - 14kt white gold, sapphire & diamond necklace. The sapphires are about 0.43 carats total weight and the diamonds are about 0.18 ct tw, VS1-2 in clarity and G-H in color. The pendant hangs on an 18" inch chain. 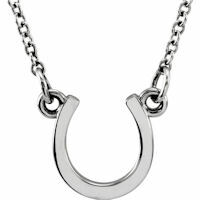 14K White Gold Horseshoe Pendant - 14kt white gold, horseshoe pendant measuring about 10x9mm in size that hangs on an 18" inch link chain. 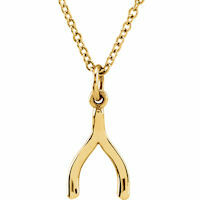 14K Yellow Gold Wishbone Pendant - 14kt yellow gold, wishbone pendant measuring about 11.5x6.5mm in size that hangs on an 18" inch link chain. 14K White Gold Wishbone Pendant - 14kt white gold, wishbone pendant measuring about 11.5x6.5mm in size that hangs on an 18" inch link chain. 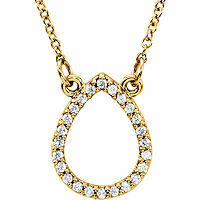 14K Yellow Gold Oval Pendant - 14kt yellow gold, 0.166 ct tw diamond, SI1-2 in clarity and G-H in color, oval pendant. The pendant hangs on a 16" inch link chain. 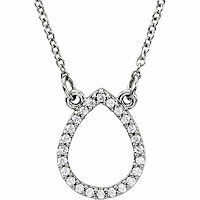 14K White Gold Oval Pendant - 14kt white gold, 0.166 ct tw diamond, SI1-2 in clarity and G-H in color, oval pendant. The pendant hangs on a 16" inch link chain. 14K Yellow Gold Tear Drop Pendant - 14kt yellow gold, 0.125 ct tw diamond, SI1-2 in clarity and G-H in color, diamond tear drop pendant. The pendant hangs on a 16" inch link chain. 14K White Gold Tear Drop Pendant - 14kt white gold, 0.125 ct tw diamond, SI1-2 in clarity and G-H in color, diamond tear drop pendant. The pendant hangs on a 16" inch link chain. 14K Yellow Gold Star Diamond Pendant - 14kt yellow gold, 0.166 ct tw diamond, SI1-2 in clarity and G-H in color, star diamond pendant. The pendant hangs on a 16" inch link chain. 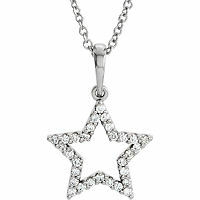 14K White Gold Star Diamond Pendant - 14kt white gold, 0.166 ct tw diamond, SI1-2 in clarity and G-H in color, star diamond pendant. The pendant hangs on a 16" inch link chain. 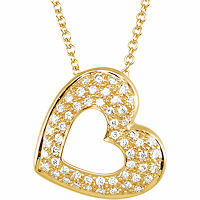 14K Yellow Gold Heart Pendant - 14kt yellow gold, 0.25 ct tw, SI1-2 in clarity and G-H in color, diamond heart pendant. The pendant hangs on an 18" inch chain. 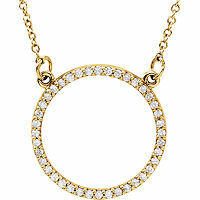 14K Yellow Gold Halo Necklace - 14kt yellow gold, 0.20 ct tw diamond, SI1-2 in clarity and G-H in color, halo necklace. The pendant hangs on an 18" inch link chain. 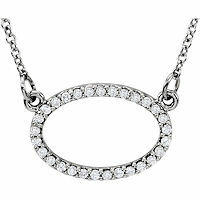 14K White Gold Halo Necklace - 14kt white gold, 0.20 ct tw diamond, SI1-2 in clarity and G-H in color, halo necklace. The pendant hangs on an 18" inch link chain. 14K Yellow Gold 0.50 Ct TW Halo Pendant - 14kt yellow gold, 0.50 ct tw diamond, SI1-2 in clarity, and G-H in color, halo necklace. The pendant hangs on an 18" inch link chain. 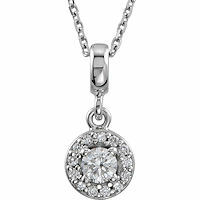 14K White Gold, 0.50 Ct Tw Halo Pendant - 14kt white gold, 0.50 ct tw diamond, SI1-2 in clarity, and G-H in color, halo necklace. The pendant hangs on an 18" inch link chain. 14K Yellow Gold, 0.875 Ct Tw Halo Pendant - 14kt yellow gold, 0.875 ct tw diamond, SI1-2 in clarity and G-H in color, halo necklace. The pendant hangs on an 18" inch link chain. 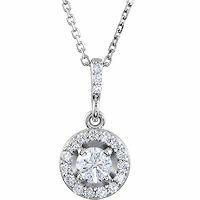 14Kt White Gold Circle Pendant - 14kt white gold, 0.10 ct tw diamond, SI1-2 in clarity and G-H in color, diamond circle necklace. The pendant hangs on a 16" inch link chain. 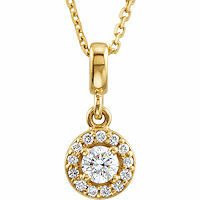 14K Yellow Gold Circle Pendant - 14kt yellow gold, 0.20 ct tw diamond, SI1-2 in clarity and G-H in color, circle necklace. The pendant hangs on a 16" inch link chain. 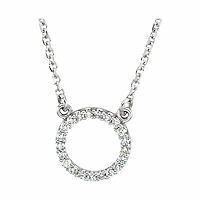 14K White Gold Circle Pendant - 14kt white gold, 0.20 ct tw diamond, SI1-2 in clarity and G-H in color, circle necklace. The pendant hangs on a 16" inch link chain. 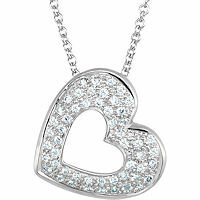 14K White Gold Heart Diamond Pendant - 14kt white gold, 0.25 ct tw, SI1-2 in clarity and G-H in color, diamond heart pendant. The pendant hangs on an 18" inch chain. 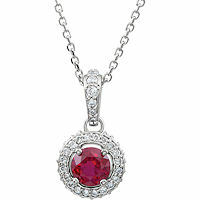 14Kt White Gold Ruby Halo Necklace - 14kt white gold, diamond and ruby halo neckace. There is one ruby in the center that measures about 4.6 mm in size with diamonds surrounding the stone. The diamonds are 0.25 ct tw, SI1-2 in clarity and G-H in color. The pendant hangs on an 18" inch link chain. White Gold Sapphire & Diamond Halo Pendant - 14kt white gold, diamond and ruby halo neckace. 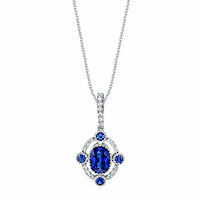 There is one sapphire in the center that measures about 5.0 mm in size with diamonds surrounding the stone. The diamonds are 0.25 ct tw, SI1-2 in clarity and G-H in color. The pendant hangs on an 18" inch link chain. 14K Yellow Gold Teardrop Pendant - 14kt yellow gold, teardrop necklace measuring about 15x11 mm in size that hangs on a 16" inch link chain. 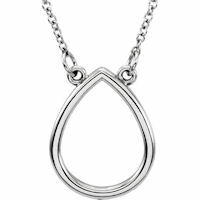 14K White Gold Teardrop Pendant - 14kt white gold, teardrop necklace measuring about 15x11 mm in size that hangs on a 16" inch link chain. 14K Yellow Gold Pyramid Pendant - 14kt yellow gold, pyramid pendant that hangs on a 16.25" inch link chain. 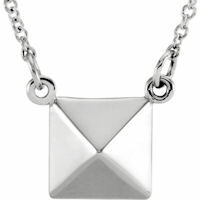 14K White Gold Pyramid Pendant - 14kt white gold, pyramid pendant that hangs on a 16.25" inch link chain. 14K ellow Gold Horseshoe Pendant - 14kt yellow gold, horseshoe pendant measuring about 10x9mm in size that hangs on an 18" inch link chain. 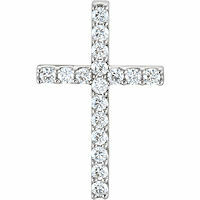 14Kt White Gold Diamond Cross - 14kt white gold, diamond cross necklace. The diamonds are about 0.34 ct tw, SI1-2 in clarity and G-H in color. The pendant hangs on an 18" inch link chain. 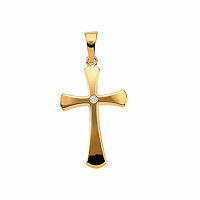 14K Yellow Gold Diamond Cross Pendant - 14kt yellow gold, diamond cross pendant. There is one round brilliant cut diamond set in the center of the cross. The diamond is 0.005 ct, SI1-2 in clarity and G-H in color. The size of the cross is 21x14mm and the chain is sold separately. 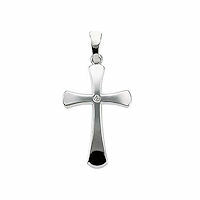 14K White Gold Diamond Cross - 14kt white gold, diamond cross pendant. There is one round brilliant cut diamond set in the center of the cross. The diamond is 0.005 ct, SI1-2 in clarity and G-H in color. The size of the cross is 21x14mm and the chain is sold separately. 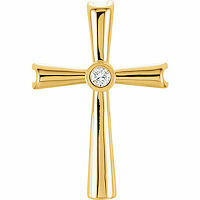 14K Yellow Gold Diamond Cross - 14kt yellow gold, diamond cross pendant. There is one round brilliant cut diamond set in the center. The diamond is 0.04 ct, SI1-2 in clarity and G-H in color. The cross is 21x14mm in size and chain is sold separately. 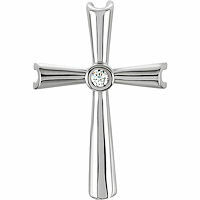 14K White Gold Diamond Cross - 14kt white gold, diamond cross pendant. There is one round brilliant cut diamond set in the center. The diamond is 0.04 ct, SI1-2 in clarity and G-H in color. The cross is 21x14mm in size and chain is sold separately. 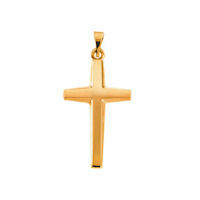 14Kt Yellow Gold Cross Pendant - 14kt yellow gold, cross pendant. The size of the cross is 25.5x14mm and the chain is sold separately. 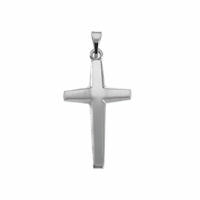 14Kt White Gold Cross - 14kt white gold, cross pendant. The size of the cross is 25.5x14mm and the chain is sold separately. 1/2 ct Diamond 14K Pendant. 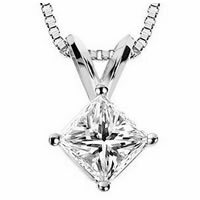 - 14K gold 0.50 ct princess cut diamond pendant. The diamond is graded as SI1-2 (minimum SI2) in clarity and minimum I in color. 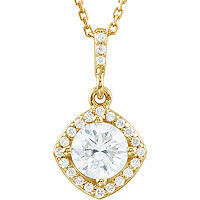 3/4 ct Diamond 14K Pendant. - 14K white gold 0.75 ct princess cut diamond pendant. The diamond is graded as SI1-2 (minimum SI2) in clarity and minimum I in color. 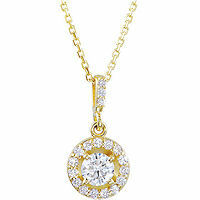 3/4 ct Diamond 14K Pendant. - 14K gold 0.75 ct princess cut diamond pendant. The diamond is graded as SI1-2 (minimum SI2) in clarity and I in color. 1/2 ct Diamond 14K Pendant. - 14K white gold 0.50 ct princess cut diamond pendant. The diamond is graded as SI1-2 (minimum SI2) in clarity minimum I in color.